It will be one of the cables going to the phone hub. Just need to figure out which one then connect it to one of the spare data ports. You could try giving the lounge cable a small pull from the outlet end and see which cable moves moves a little, you might be able to figure out which one it is that way. I would say you probably want to get a BigHammer or Coffeebaron or whoever helped you last time back to sort the thing out properly as you probably don't want to learn a whole bunch about networking and data cabling. Personally I'd want to add a 2nd data hub then wire all the Cat5 cables to the two data hubs properly (all 8 wires! ), then get some of those splitters Cyril mentioned for the cables sharing services (voice and data), then get one of those Sigtech phone patch units (so you can patch any outlet to data or phone really easy) and take the existing R-002 phone block out (sell it on tradme or something). Will cost you $$$ for the two parts and beer or $$$ for the time, I reckon it will be worth it to sort it properly but really it's a personal decision whether it matters enough to you. I got BigHammer around to my house this morning and he has successfully changed the lounge port into data, during that we noticed there ARE two cables so it appears that it CAN have both data and phone. I have rung Fyfe Homes left a message for manager to ring me back. I will be telling him that I am getting a reputable company out (friend of BigHammers) to give me a full quote on what is needed to fix this mess and as long as we can afford it, we will be changing all ports to both data & phone (if possible). I will be asking if they would be willing to contribute to the cost of fixing this mess. Great, its sad to see stuff like this happen, if I were in Auckland myself I would happily help, puts a bad light on what should be a good experience. In a nutshell is going to discuss it with the sparky. I told him I would be getting someone in to give me a full rundown on what needed to be done. I also told him I would send the thread of my initial post to him so he could see for himself all the comments made by other technhicians/consultants/sparkys here. I hate the fact that sparkys (who often have a hard enough time with AC wiring) are even thinking they can install services like this. The level of training they seem to end up with compared to the time taken seems to give some very useless output from etco. I'm just glad I have a very competent relative who is a sparky to do my mains work that needs it, and even he doesnt do the data side of it because he doesnt have the right test gear and is too busy on electrical stuff. 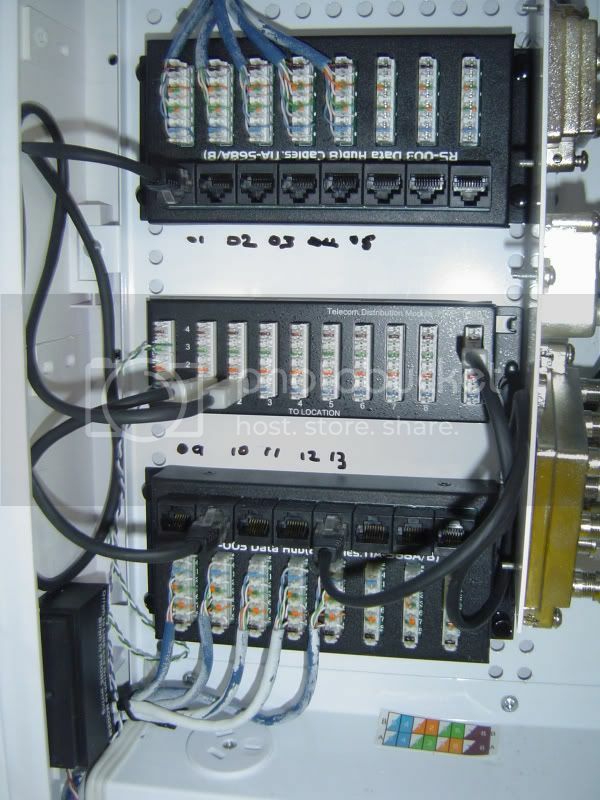 Have you even got any documentation from the builder that the cables have been installed to meet cat5e or cat6 specs including data from a cable tester? Because if they have said you get cat5e or cat6 cabling, they better have something to prove it. 1. Chris will be in Karaka Lakes this Friday. 2. He will label the cables/leads so you can identify them. 3. He will 'clean up' the wiring. 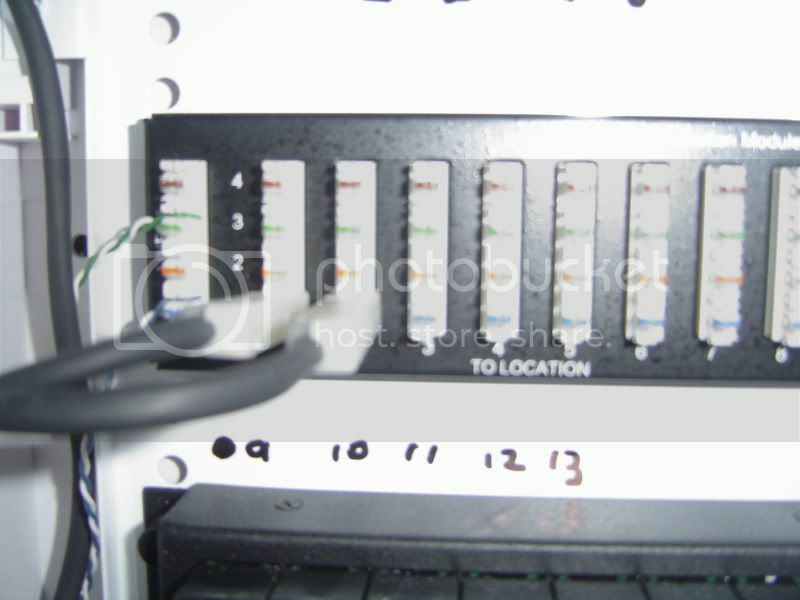 He offers you the option of 'punching down' all the cables for data which will make things much cleaner but does mean that you will require patch leads if you want to utilise phone. 5. If you have questions, he will answer them as best he can. 6. Ultimately, you may still need a tech to customise the installation but he will then be working from a 'clean' base. I take your point about the box in the cupboard. Unfortunately all the ideal walls were brace units and I simply can't allow people to pierce the brace walls, because that would put me (and potentially you when you sell) in the position of having a non-complying home. I believe speed is linked to the 'switch' which may be problematic, but I really don't know enough to be even dangerous! Of course Im still a bit leary of the sparky doing the job, but it looks like if I got someone else they wouldnt pay for it. I fear Im going to have to take him up on his offer. I would be happy with all the cables being data, we only have 2 phones in the house and will never have anymore than that. What does he mean by patch lead for the phones? He felt sure that the master bedroom should have 1Gbit speed at least but it doesnt. Oddly tho the port behind the TV that we have just turned from phone into data DOES appear to be 1Gbit tho. From here I would say that all downstairs is 1Gbit but all upstairs is 100Mbit at best, BUT.....the downstairs bedroom is only 100Mbit. So I dunno. Im pretty sure Mark did read the other thread that I emailed him which was very good of him. 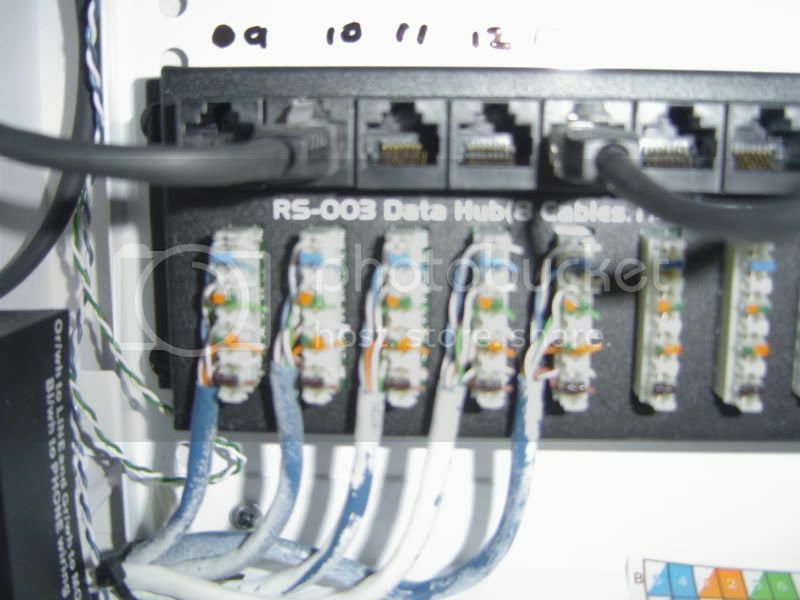 richms - Yes the specs of the home does say Cat 5e cabling. I will be emailing Mark today to take him up on his offer. all I can think of right now.....what do you guys think? As much as I would love to stand my ground Mark doesnt deserve this and Chris will no doubt learn from it so he doesnt leave a new home in a state like this. I would love to tell them to put in ST2000 and everything that you say above Ragnor but unfort finances wont allow it (after buying the damned new home, lol). but I really don't know enough to be even dangerous! Based on that thanks but no thanks, find me someone who knows his stuff. I would suggest his comment about phone patch leads, he probably refers to the need to RJ45 to RJ11 line cords, you can get them for just a couple of $ from wholesalers, even DSE have them for $12-15ish. 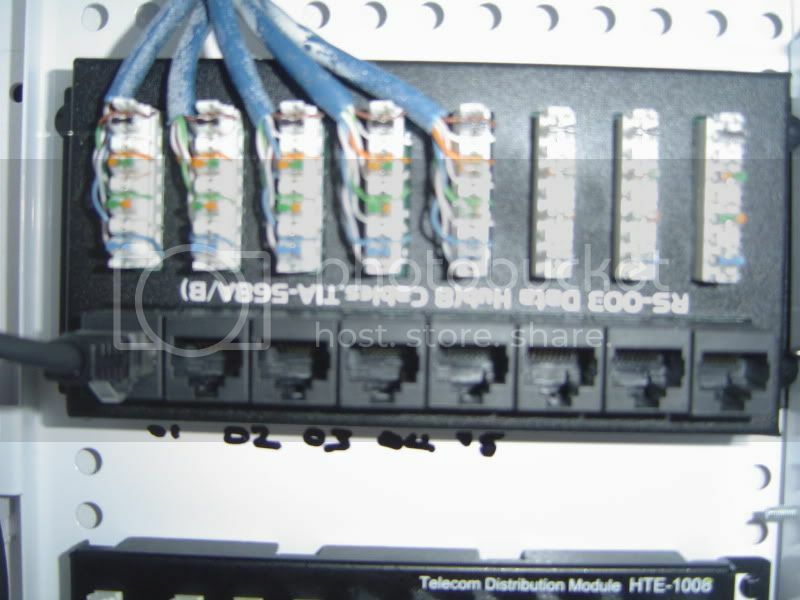 If you stay with the current phone module then just get a standard cat5 patch cord cut in half and get a the two halves with the blue pair punched down to the phone line on the module, you can then plug the phone to a couple of TOs. If you want to line share ethernet and phone then get a proper line splitters as linked earlier, the may look a little messy but are a better solution. Might I suggest that the reason you dont get GigE on some ports is because of bad workmanship. The level of cable unsheathing and untwist shown in your photos is quite honestly very very bad and I would suggest that is responsible for the lack of performance. These are high frequency transmission lines, does your sparkie now anything about high frequency transmission lines, ............ I thought not, so why is he doing something he has no right to do. There's no GigE anywhere because the blue pair is hooked up to the phone line for most cables. The port behind the TV is only GigE to the switch in the cupboard upstairs, because I put all 4 pairs through. You wont get GigE to the router because the blue pair in that cable is the line feeding ADSL to the router, and in the master bedroom the blue pair feeds the phone. If the Sparky labels everything up properly, that should identify the "spare" cables in the bedroom and lounge meaning both ports could be GigE and an additional RJ45 port could be added (with a change of face plate) to give you voice at those locations also. You could also move the ADSL modem to the cupboard which would mean you could essentialy have GigE between all data ports currently in use. Many thanks for the phone-call BigHammer, sorry the above wasnt meant to be asking you to come out, lol. Have sorted it all out in my brain I think and jotted it all down. Just had a look in the dining area point and unfortunately there is no 2nd cable there. No problem at all Shelley. Now all thats left to do is put the modem/router up to the hub.